Blog: Land, Sea and Air. This event took place in London aboard HQS Wellington on Saturday 21 October. Adrian van der Meijden: IWC Mark 11 Wristwatches used by the B.O.A.C. The conference was organised by the BHI. For more details, see Land, Sea and Air Conference. Wristlets were fob watches worn on the wrist in leather cups by soldiers in the nineteenth century. Long time watch collector Richard Edwards searched thousands of photographs in the National Army Museum and Royal Artillery Firepower Museum and observed no wristlet watches in photographs taken before 1885, but plenty in photographs taken in India/Burma after 1887 and concluded that wristlet watches came into widespread use by British Empire forces in India or on the Northwest Frontier between 1885 and 1887. Although these were watches worn on the wrist, they were not wristwatches. The first purpose made men's wristwatches were not conversions of fob watches as people often say, but were in fact purpose made. The true wristwatch required the combination of a savonnette movement in a Lépine case, something that did not happen by accident. 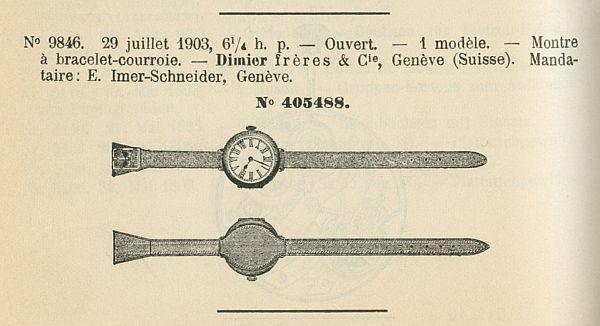 Dimier Brothers registered the design of a wristwatch shown here, with wire lugs and a leather wrist strap in Britain in February 1903 and in Switzerland in July 1903, well before the Cartier Santos Dumont watch was made in 1904. This is discussed at Watches with Handles. The take up of these wristwatches was slow, my 1906 IWC Wristwatch is one of the earliest that I know of. There are men's wristwatches that can be dated by British hallmarks to before the Great War, but these are few compared to the number that date from the war years. Evidence that men's wristwatches were starting to take off comes from an advert in 1907 in which Dimier Brothers advised watch manufacturers that they must have cases with wire lugs stamped with their Registered Design mark No. 9846 and pay a royalty fee. Early wristwatches often carry the number 9846 as a result. No doubt these were popular with military men, but sales of wristwatches to civilian men were slow until millions of them saw officers wearing them during the Great War. As British Army officers had been wearing watches on their wrists since 1885 it was no surprise that they wore them during the Great War (WW1, the First World War). 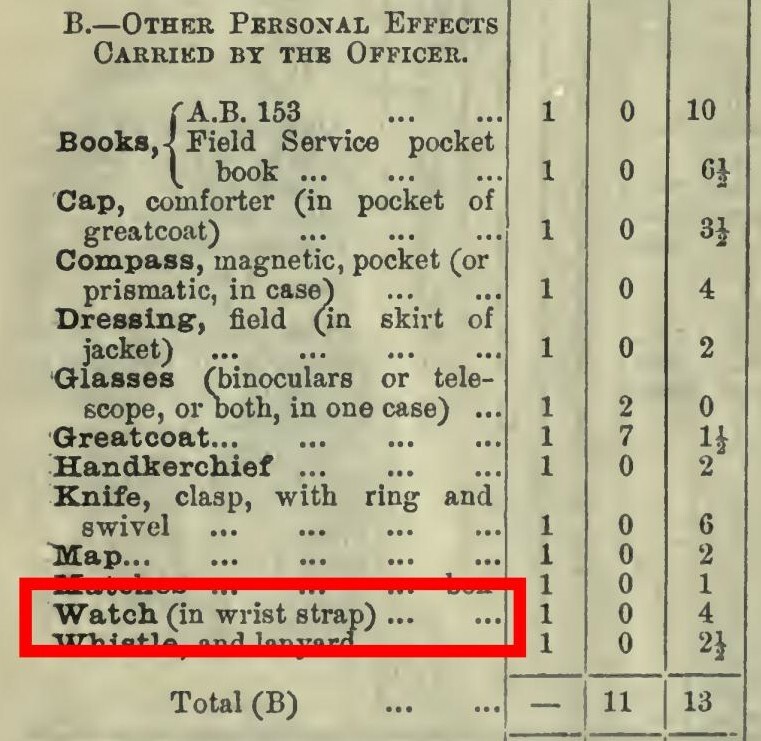 The extract here from the British Infantry Battalion (Expeditionary Force) Field Service Manual date 1 October 1914 shows that the military authorities expected an officer to wear a wristwatch. The table that this was extracted from was drawn up to calculate the total weight of a battalion for transport and shipping purposes. The British Expeditionary Force was transported across the channel on ships and it was necessary to know the weight when working how how many ships were needed. The first column shows the number of items, the second and third columns their weight in pounds and ounces. The watch in the Field Service Manual table was a fob watch worn on the wrist in a leather wristlet, but the extra convenience of a purpose made wristwatch with wire lugs and leather strap, which would easily fit under a shirt cuff, made wire lug wristwatches popular. This style soon became known as a "trench watch" for obvious reasons. The earliest use of the term that I have seen is an advert in "The Sketch" magazine dated 15 Dec 1915 by J W Benson of Ludgate Hill and Old Bond Street London. The advert illustrates only ladies' bracelet watches, but it also mentions "Trench Watches in Silver Cases with leather strap from £2 . 2s." In the conditions of the trenches an effective specification for a military wristwatch was soon developed at the front and communicated to other officers, it must have a luminous dial and unbreakable glass. This is discussed at Anatomy of a Trench Watch. Officers received an allowance of around £50 for the purchase of their kit, including uniform, sword, revolver, field glasses, and wristwatch. Although these wristwatches are often described as "private purchases" it is clear that an officer was expected to wear a wristwatch, and that funds were provided to him by the military authorities to buy one. Was this then a private purchase? I think not. These then were actually the first British Military wristwatches, even though they carry no military markings. There was a huge demand for officer's kit at the start of the Great War. There were queues at tailor’s shops to be measured for uniforms, and many items were in short supply. Officers advertised in The Times newspaper for revolvers, field glasses and wristwatches. 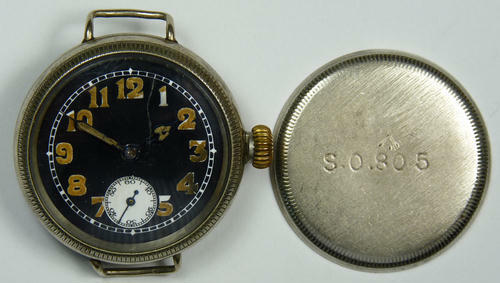 This is when conversions of fob watches into wristwatches occurred, due to lack of supply to fill the demand of newly commissioned officers who were eager to get kitted out and get to the front before they missed all the action — in 1914 it was thought that the war would be over by Christmas. Towards the end of the war the War Department started to issue wristwatches. These were issued to Other Ranks who weren’t given an allowance to purchase one. These were signallers, telegraphers or telephonists operating in front line trenches who would put the time on received messages. In 1914 a British Expeditionary Force Infantry Battalion of 1,000 men received eight issued watches. One went to the Signalling Sergeant, the others were shared among 16 Royal Engineers Signallers. In 1914 these would have been pocket watches, but at the front it would have been realised that wristwatches were easier to use, and also less likely to be lost. Timing was also important to gun batteries, who could gauge the range of an enemy gun from the time of flight of a shell. Watches used to do this were pocket watches or pocket chronographs, or stop watch timers. Although officially marked with the British military property mark, the pheon (broad arrow), I do not regard these issued wristwatches as the first British military wristwatches. They were only issued late in the war, and only to other ranks who would not be given an allowance to purchase their own wristwatch. Wristwatches purchased in the pre-war years, and during the war by thousands of British officers as part of their kit are the true first British military wristwatches. Copyright © David Boettcher 2006 - 2019 all rights reserved. This page updated March 2018. W3CMVS.